Sunday is a fine time to slow down, take a break from the week and relax. I’ve been taking some time to do some handwork, starting a Redwork Project a couple of weeks ago. Only a little bit has been accomplished so far though. I did get the bottom section finished last time I had a bit of stitching time, and started on the Santa. But, most of my time lately has been taken up with preparing for the Mountain Regional State Fair coming up in September. Turn in day is just over 3 weeks away at this point, and I have a lot to do. This year I made it a goal to get everything ready ahead of the deadline, not the night before, LOL!! 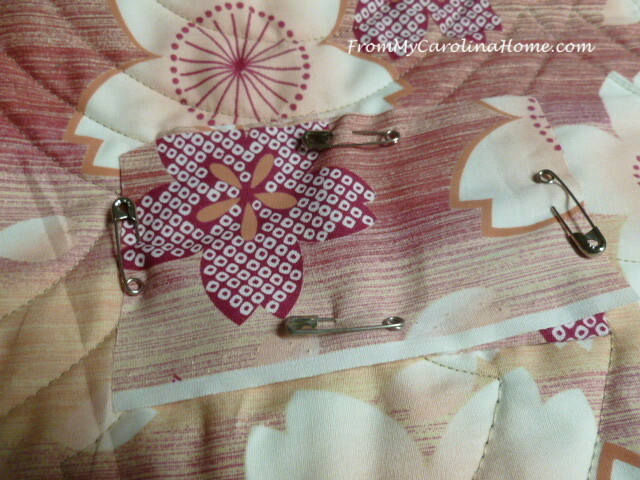 Three of my quilts needed temporary sleeves for hanging. 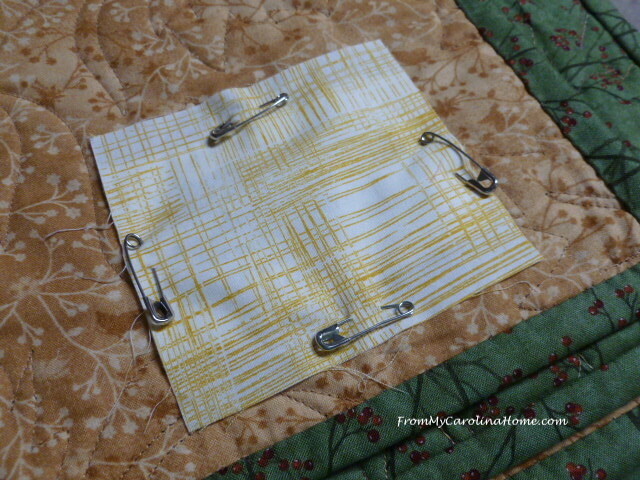 I have a tutorial on that – Temporary Hanging Sleeves. 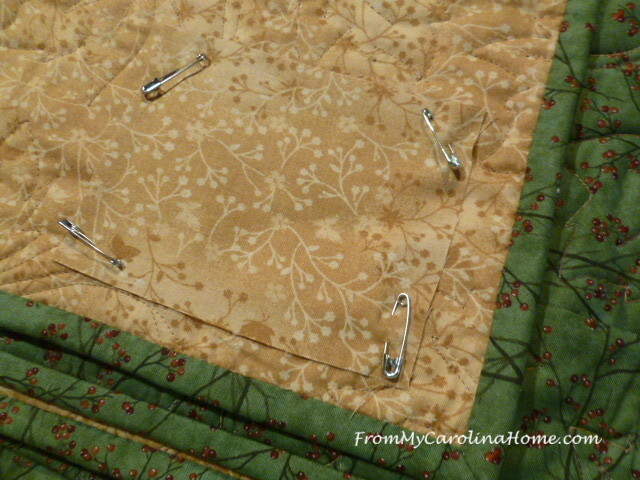 I put these on by hand with long whip stitches that are easy to remove, but will hold the quilt. Then all the quilts needed labels. 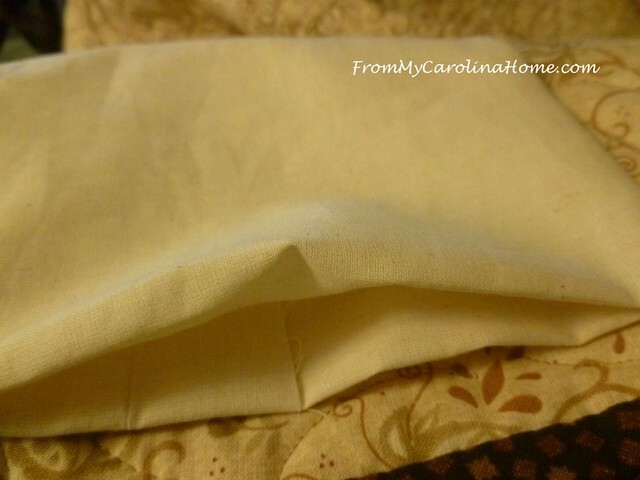 All the labels have to be covered with pinned fabric or paper to cover the name of the maker. 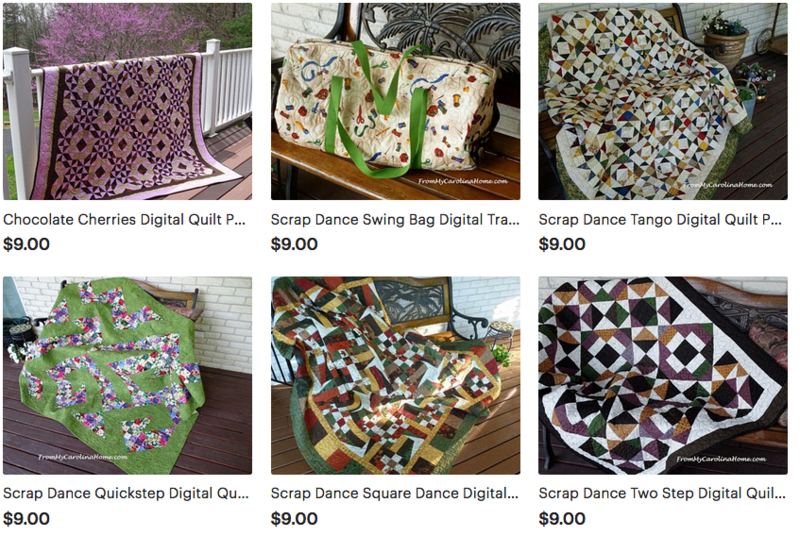 I’ll be entering Scrap Dance Square Dance in the bed quilts category. I am working on that pattern now, and hope to have it published in early September. I found a scrap of the same backing fabric to cover the label, as the backs will be visible. The quilts hang from the ceiling of the exhibit center at the fair so they can be seen but not handled. 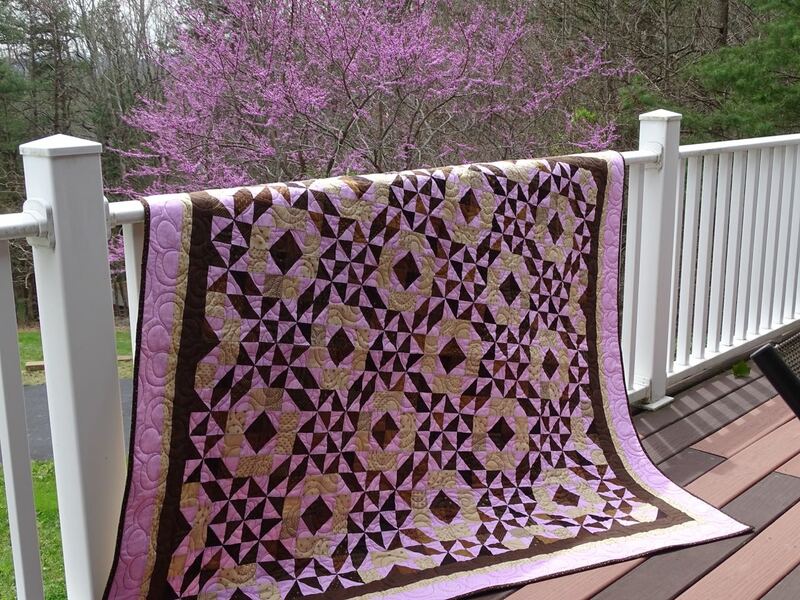 Chocolate Cherries is entered in the throw quilts category. Chocolate Cherries Quilt Pattern is still on introductory sale for $5 on Craftsy. And I had a scrap of its backing to cover the label too. 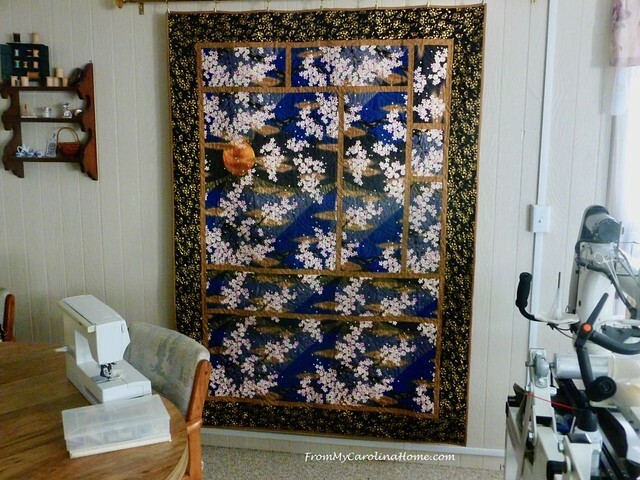 I am entering Sakura Tsuki, my Japanese art quilt in the wall quilts category. Amazingly, I found a scrap of its backing fabric to cover the label here as well. So that’s what I have been working on for now. 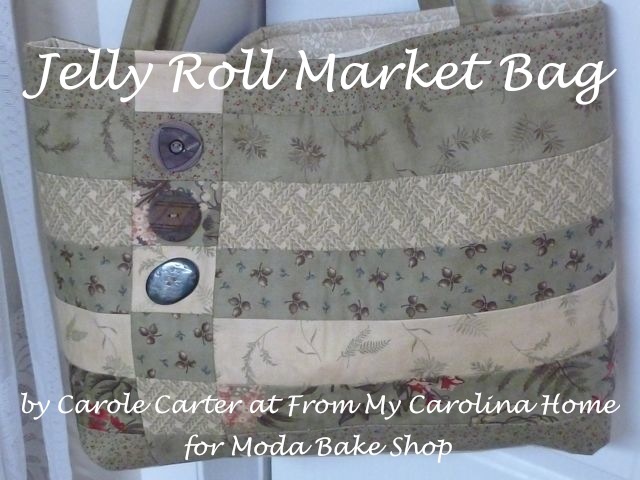 I still have labels to do for the smaller projects like purses, and table runners. But I have a good start, and this year might get done ahead of schedule. I already have my photographs mounted for the photography competition, and my recipes are written and tested for those competitions as well. I want to make a natural materials art piece from an empty bird nest made by a Carolina wren I found on my veranda. And I still need to get my Christmas ornament and wreath finished for those competitions. So, still a few things to do, Labor Day and the Apple Festival will be here before I know it!! What are you working on this fine Sunday? 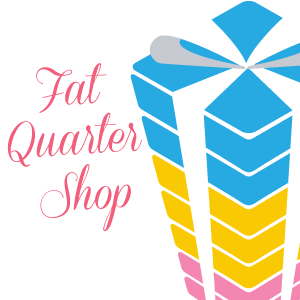 Fat Quarter Shop has 10% off Cross Stitch Projects and Notions with the Promo Code STITCH10, Today only!! New floss bundles in seasonal colors look tempting! Good for you…not waiting until the last minute!! That is MY modus operandi!! Lovely entries. Good morning Carole…..After reading your blog this morning, with all that you’ve done, and still have to do, I’m so worn out, that I’m going to take the day off. LOL I had no idea you submitted entries in so many categories. Hopefully, you will be the recipient of as many awards as you have entries, since you definitely deserve it. Maybe they should have a category in Tableskaping! that should be an exciting fair this year. It is fun to look at all of the entries. Your embroidery is very good and neat. Practice does make perfect. I have few places I can sit and embroider, daddy likes to walk around, grand babies are nosey and grabby. I have tried while treadmilling. It’s no wonder that you haven’t had much stitching time. Good luck at the fair this year. 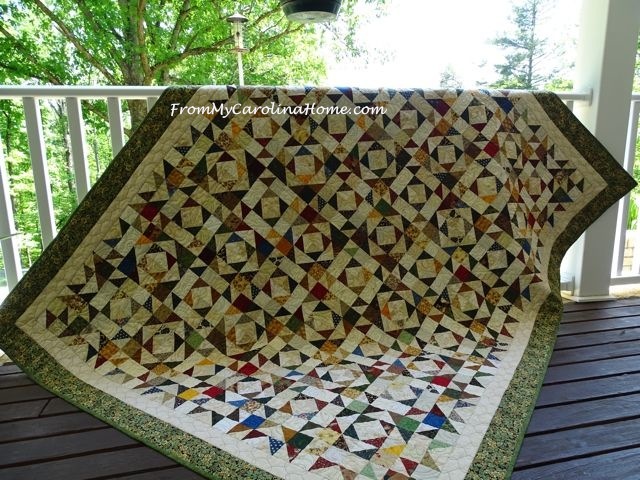 Although I love all of your quilts, I really hope your Asian Wall hanging wins a ribbon…I still remember seeing it (on the blog) as you created it and I thought it was beautiful!! Sounds like you are going to be much more ready this year and hopefully avoiding being up all night the day before drop off! Interesting info about the temporary sleeve and having to cover your labels. 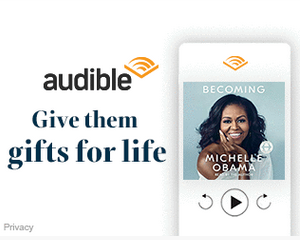 I haven’t entered a competition yet with that criteria. I’ve got a couple of embroidery kits I need to choose one to concentrate on. 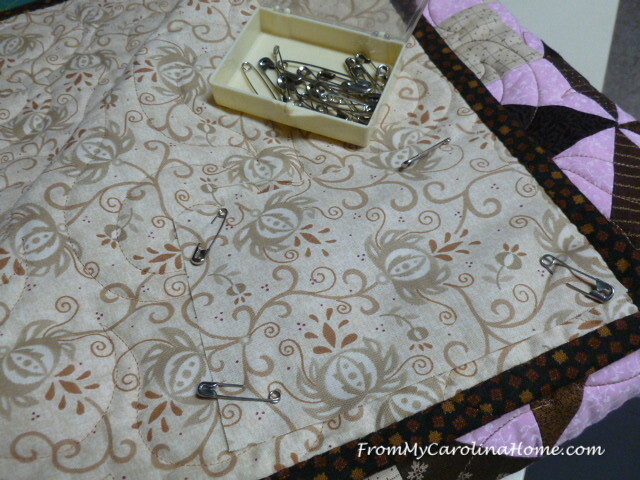 Currently, I am free motion quilting an Indianapolis Colts lap quilt. Gosh you have been busy! Fingers crossed for your at the quilt show! Best wishes on your entries Carole! 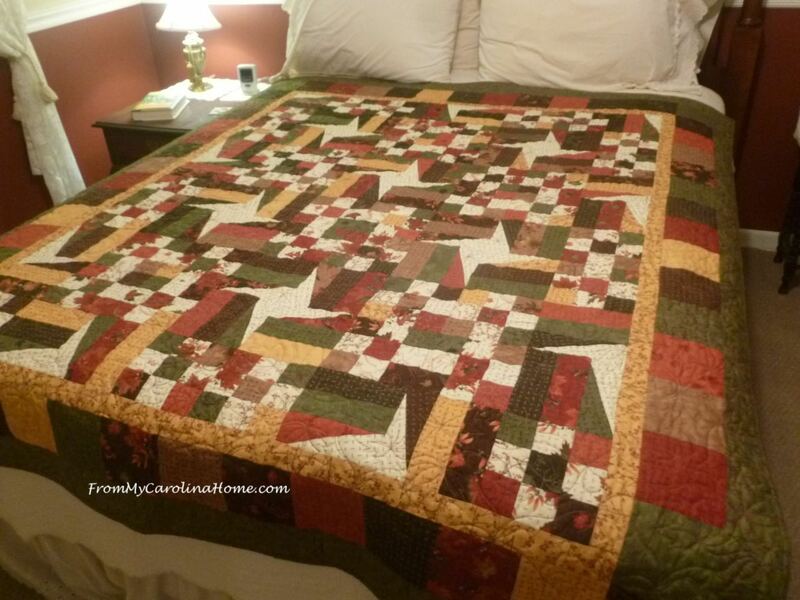 They are such beautiful quilts! 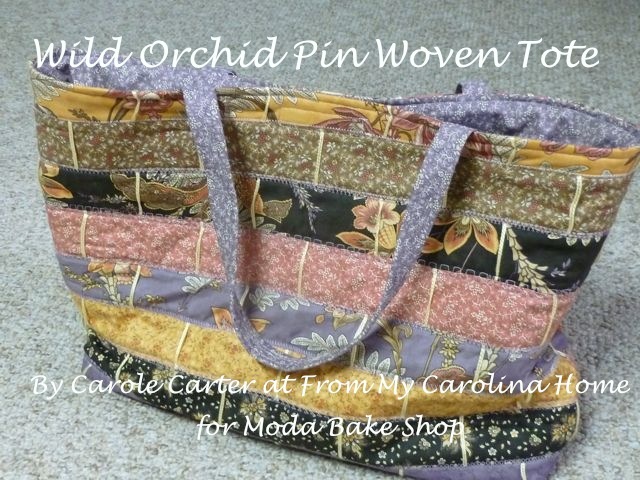 I love how you dabble in a little bit of everything…….from hand stitching………to quilting…….to table scapes……to cooking! You’re my kind of gal! Love your red work. Sometimes easy stitching is so soothing. LOVE your fair entries and the Japanese one I think will be an original!!! 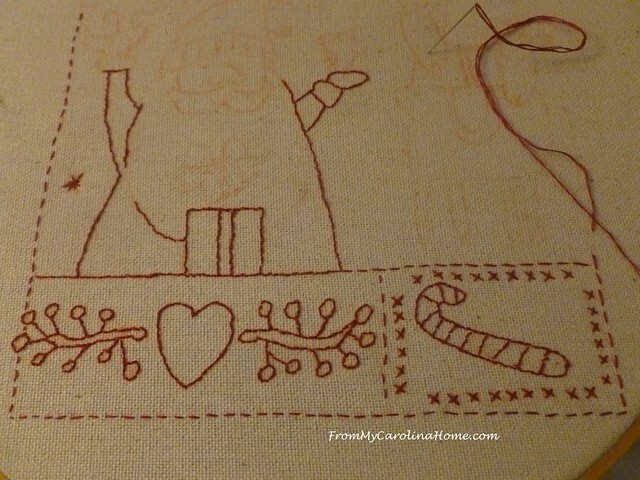 I love redwork, but have never tried any. Yours is going to be beautiful, Carole! Do you have any ideas about where a kit could be found, since the place you ordered yours from seems to be out of business? Good luck with your fair entries! 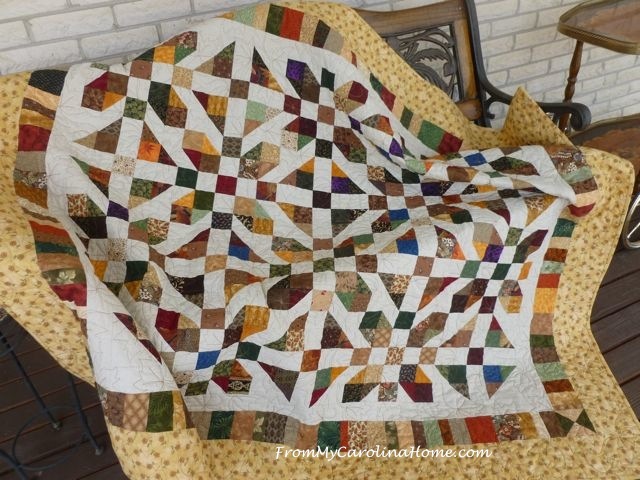 Hello Carole; All of your quilts are bound to be winners! I bet you are feeling a lot less stress with getting these steps done and preparing in advance what else you need to do. I have not heard if we are going to have a fair this year or not (again). 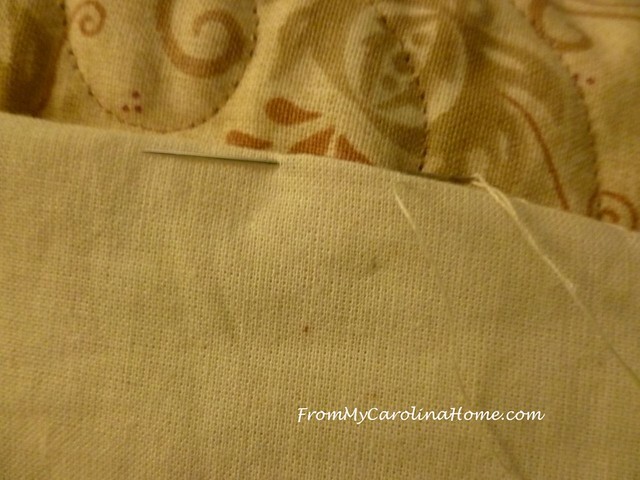 Stitching is fabulous for slow down times, yet it is also hard at times to slow down long enough to do the stitching. LOL. I am not sure what I am going to do today as of yet. I sure hope that you have a fantastic day! I’ve never entered a quilt in a fair…I should do that sometime. Good for you getting everything prepared ahead of time. I don’t like to fell the pressure of last minute finishing either. Wow, you have a whole lot of beautiful items to be entered. Good luck in getting everything ready early. 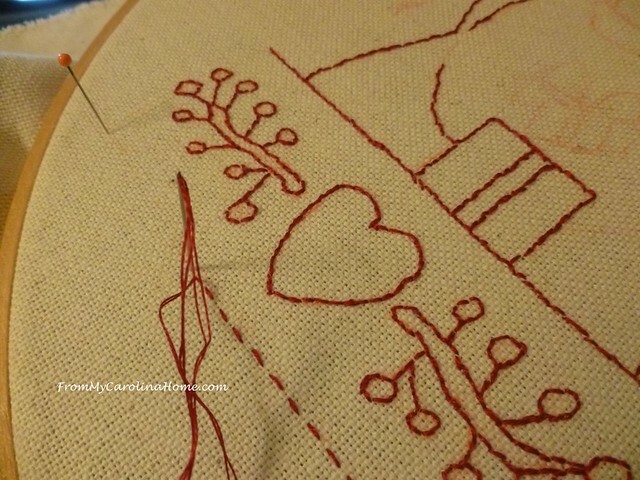 Your redwork is coming right along! I love getting ready for the fair. I need to think about what I am going to enter, since it is looming very quickly! It sounds like you have been getting those nasty little details done ahead of time! 🙂 Today I have been working on studio stuff; I am going to the Home School Open House tomorrow evening, so need a few things printed out. Wow – you are super busy, and at the same time organised. Good luck at the fair, Carole. I think you have plenty to keep you busy through fair time! You do have a busy time ahead of you. Good luck with all the preparation. 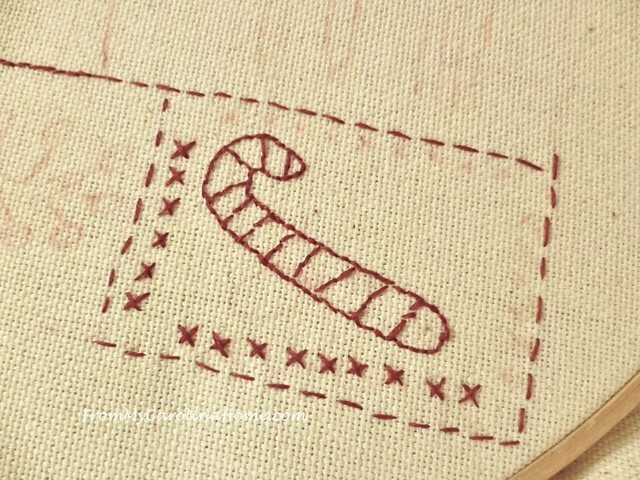 I really like your redwork Christmas project. I did some redwork early in my quilting journey and enjoyed it; I should think about finding another pattern to try. I’m interested to see what your Santa gets made into!